The District has a 1590 John Deere No-till Drill available for rent for conservation tillage. The drill is 15 feet wide and roadway transportable by truck or tractor. 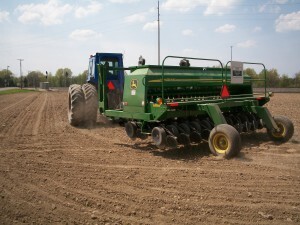 An eighty horsepower tractor (or larger) with hydraulics, is needed for field operations. Rental rate is $10 per acre for all crops planted. The drill is available for continuous run after business hours and weekends. Contact the District office for scheduling and sign up at: 419-626-5211, 1-877-778-7645 (Toll Free), or 419-271-5940 (cellular). 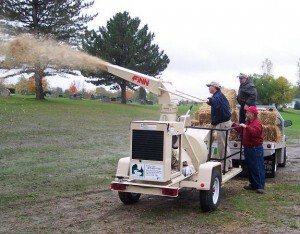 A Finn Straw Blower is available for rent at $50.00 minimum and $12.50 per meter hour after 4 hours. A $50.00 deposit must be paid prior to use. The trailer mounted unit allows easy transport to your site. The blower has a rated capacity of 7 tons of straw per hour. The unit is user friendly and can be operated easily with a short demonstration by district staff. Contact the District office at 419-626-5211 weekdays to schedule use. 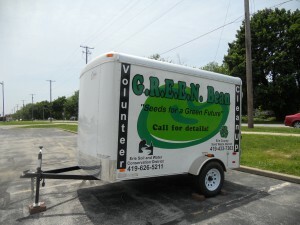 The Erie Conservation District and the Erie County Solid Waste District is pleased to announce the G.R.E.E.N Bean Clean-up Trailer is FREE of charge for volunteer groups that wish to have a clean-up or beautification event in their city, village or township of Erie County. The trailer is fully equipped with tools and all the necessary equipment for a successful cleanup event. The trailer is available to be picked up or dropped off. Contact the Erie Conservation District at 419-626-5211 to check availability and/or reserve it for your event today! 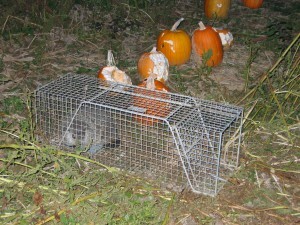 Free to use to catch and release/dispatch small and medium nuisance wildlife such as groundhogs, skunks, feral cats, rats, weasels, rabbits and raccoons. Remember to follow Ohio’s laws on nuisance wild animal control. The District has several traps available, call ahead to check availability. Photo ID and signature needed at time of rental. If you have invasive shrubs such as honeysuckle, autumn olive, privet, glossy buckthorn, give the Weed Wrench a try. This device allows you to pull out the entire plant, roots and all, with a very satisfying rip! We have sizes ranging from small to extra large to assist in the removal of shrubs up to 1.5″ in diameter. These tools are available at no cost, picture ID and signed usage agreement due at rental. 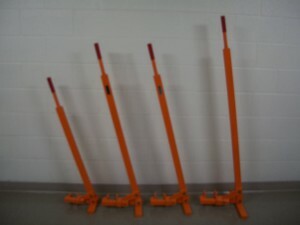 Please call ahead for availability as we do not keep these tools onsite. 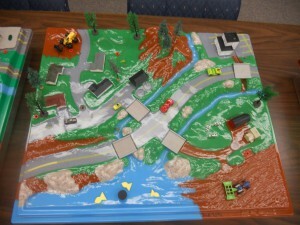 The Enviroscape model helps students learn about watersheds, how human impact causes runoff pollution & erosion, and solution ideas. We have several units including two non-point source models, a coastal wetland model, and water and waste water treatment model. Models include city/landscape, water bottles for simulating rainfall, and “pollutants” for an interactive opportunity to learn about the cause and effect of our daily actions. The Groundwater Flow Model is a fascinating look into the mysterious world under our feet. 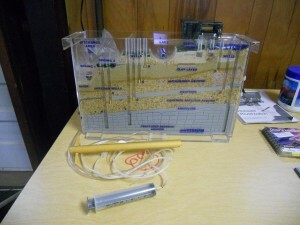 This model shows groundwater, how it works in the water cycle, what happens with a well and septic system, the water table & more.